JERUSALEM. — Outside Orient House, the PLO headquarters seized by Israel after a suicide bomber killed himself and 15 other people in Jerusalem, dozens of Palestinian and foreign demonstrators — most of them Europeans — wrestled with club-wielding Israeli police and tried to raise Palestinian flags. Ten protesters were arrested. JERUSALEM. — In these tense, violent and dangerous times, it was a moment of hope: 300 demonstrators, Israelis and Palestinians, standing together in protest of the occupation of Orient House and the other Palestinian institutions in and around Jerusalem. It went on, from beginning to end, without police violence — a far from negligible achievement considering the extreme brutality which the police used in the previous four days, in full view of the international press, against anybody who dared protest the occupation of Orient House: Palestinians, internationals, and Israelis alike. In fact, tense negotiations with the police had been going on from Sunday morning, when Gush Shalom and the Women’s Coalition for Peace published their joint call for a protest demonstration, until well past the start of the action itself on Tuesday afternoon. It started with senior police officers phoning the organizers, altogether forbidding the action and making dire threats against anybody who would dare try to approach anywhere near the Orient House. Later the police gave way to the organizers’ insistence and started to haggle on terms. They wanted the demonstration to take place as far from the Orient House as possible; we, of course, wanted it as near as we could get to the compound, around which all streets had been sealed off since last Thursday. Contacts with the police were entrusted to Jerusalem City Councilor Meir Margalit, who has some experience in negotiating with police. Meanwhile, everything was coordinated with the Orient House people themselves — who seem to have reconstituted their organizational structure within a remarkably short time, even with their physical premises occupied and many of their papers confiscated. They made clear their strong wish to keep the demonstration peaceful and avoid repetition of the violent scenes which had become so common in the past days. A major issue was the police insistence that no Palestinian flags be raised in the demonstration. The Palestinian national flag (“PLO flag” in police parlance, though in fact it had been in existence some fifty years before the Palestinian Liberation Organization was founded) had been more or less tolerated by the Jerusalem police since Oslo; now, they have gotten clear instructions to confiscate any such flag they see. For their part, the organizers rejected out of hand the police demand to ban Palestinian flags from the action: “We are no auxiliary police. We will not prevent Palestinians from raising their own flag in their own city.” What this meant was that any Palestinian flag seen in the demonstration could serve as a pretext for a brutal dispersion. The debate on the venue was still going on while the two Tel-Avivian buses were on their way. The police refused our preferred demonstrating site, on the main road in front of the famous American Colony Hotel, and wanted to herd us into a side street, overshadowed by two Israeli-owned hotels, far out of anybody’s sight. The more or less satisfactory compromise, reached on the last moment, settled upon the stretch of the Nablus Road in front of St. George’s Cathedral, about as far northwards of Orient House as the American Colony is to its south. But to get there we had to pass though the unsavory site which the police originally intended for us, which made many activists uncomfortable. And indeed, we found a police barrier blocking us from entering the main road and keeping us confined near said Israeli hotels (built on confiscated Palestinian land, as we were reminded by one of local inhabitants who came to join us). With the threat of a violent confrontation hovering in the air, there was a further hasty round of negotiations with the police — ending with the barrier being removed from our way. Chanting “Peace Yes — Occupation No!” and “Hands off the Orient House!” the demonstrators surged into the Nablus Road — a forest of banners borne by Israelis of the Women’s Coalition and Gush Shalom and a whole spectrum of smaller contingents; Palestinians of various political affiliations and social classes, from dignitaries in neat clothes to rather naughty young boys; the internationals — Americans, Italians, French, Canadians, Danes — who had borne much of the brunt of protests in the previous days. At the head marched Knesset Members Issam Mahul of Hadash, Taleb A-Sana of the United Arab List and the dissident Laborite KM Yossi Katz, together with such religious dignitaries as Akrama Sabri, the Mufti of Jerusalem, and the Anglican Bishop Riah Abu-El-Asal. It was not very much of a march (though it looked quite impressive in some of the footages we later saw on CNN); a short distance into the Nablus Road there was another police barrier, firmly held. Behind the backs of the grim “Border Guards” (actually: riot police) we could just discern the corner of the street leading to the forbidden compound of Orient House. There were some moments of chaos. Different groups started different chants. The big posters which many of us carried — with the photo of the late Feisal Husseini, founder of the Orient House — were hanged on the walls of nearby buildings. Despite their original threats, the police studiously ignored the plastic Palestinian flags carried by many of the boys. Gradually, the crowd was growing bigger. A stream of East Jerusalem Palestinians, feeling more secure than on the previous days, were coming singly or in small groups up the Nablus Road and joining us. Meanwhile, a very precarious podium was improvised on a fence to one side, for speeches delivered with the aid of a small megaphone. First to address the crowd was the young Abd- El-Kader Husseini who spoke movingly of peace and coexistence and Jerusalem as the capital of two states and vowed to continue on the way of Feisal Husseini, his illustrious father. Then the Knesset Members spoke, and Uri Avnery of Gush Shalom, and Gila Svirsky of the Women’s Coalition. Dispersal, too, was far from a straightforward issue. There was a very real apprehension that after the Israelis’ departure, the police would violently assault the Palestinian participants. To avert that danger, it was arranged that the departing Israelis would screen the Palestinians from the police and allow them to disperse unvarnished. This manoeuvre was successfully carried out — and perhaps, anyway, somebody higher up had had enough of the violent scenes daily broadcast from Jerusalem. The action was well-covered by the international media. In Israel, it was on both TV channels and in all the papers — which is far from the rule for peace actions these days. Best was Yediot Aharonot, which featured an attractive photo of three young people — two Israelis, one Palestinian — holding a giant “Down With the Occupation” sign, under the caption “Demonstrating together.” Yediot, Israel’s biggest mass-circulation paper, is the one read by most of the soldiers on duty at the confrontation lines all over the Occupied Territories. What did they make of this photo when they saw it during today’s noon break? Still, at this moment none of us can predict where we will be a week from now, and what new lunacies or crimes we will be protesting. Sharon has taken off the mask, revealing the Man of War he had always been, and busily opening ever-new fronts of conflict. Two nights ago, large Israeli military forces invaded the Palestinian town of Jenin, destroying the local police station, and departing — due to heavy Palestinian resistance, as the Palestinian sources have, or simply “because their task was finished on schedule” as the IDF spokesman insists. The struggle ahead of us is going to be long and hard still, and there will be many difficult moments. But those who were there yesterday, on the Nablus Road overlooking Orient House, came out a little bit strengthened. Adam Keller & Beate Zilversmidt, writing for Gush Shalom. Gush Shalom is a non-partisan and extra-parliamentary grassroots movements composed of Jews and Arabs, independents and members of political parties and other organizations. 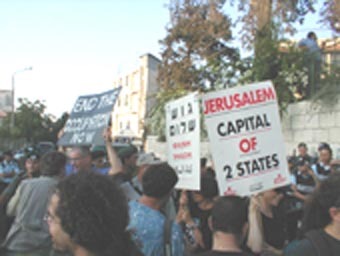 It was founded by Uri Avnery and other concerned observers in 1992 in an effort to influence public opinion following the deportation without trial of 415 Palestinians by Rabin’s “Peace Coalition government.”Photos: Indymedia - Israel.